Definition at line 63 of file objectcontainer.h. Definition at line 94 of file objectcontainer.h. Definition at line 95 of file objectcontainer.h. Definition at line 68 of file objectcontainer.cpp. Definition at line 71 of file objectcontainer.cpp. Add an object to this container. Definition at line 84 of file objectcontainer.cpp. References _objects, Aurora::NWScript::ObjectContainer::addObject(), Aurora::NWScript::ObjectContainer::lock(), and Aurora::NWScript::ObjectContainer::unlock(). 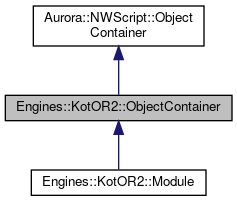 Referenced by Engines::KotOR2::Area::Area(), and Engines::KotOR2::Area::loadObject(). Definition at line 74 of file objectcontainer.cpp. 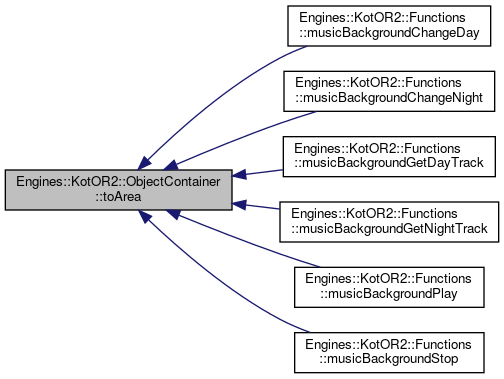 References _objects, Aurora::NWScript::ObjectContainer::clearObjects(), Aurora::NWScript::ObjectContainer::lock(), and Aurora::NWScript::ObjectContainer::unlock(). Return a search context to iterate over all objects of this type. Definition at line 114 of file objectcontainer.cpp. Return the first object of this type. Definition at line 104 of file objectcontainer.cpp. References _objects, and Aurora::NWScript::SearchRange< T >::get(). Remove an object from this container. Definition at line 94 of file objectcontainer.cpp. References _objects, Aurora::NWScript::ObjectContainer::lock(), Aurora::NWScript::ObjectContainer::removeObject(), and Aurora::NWScript::ObjectContainer::unlock(). 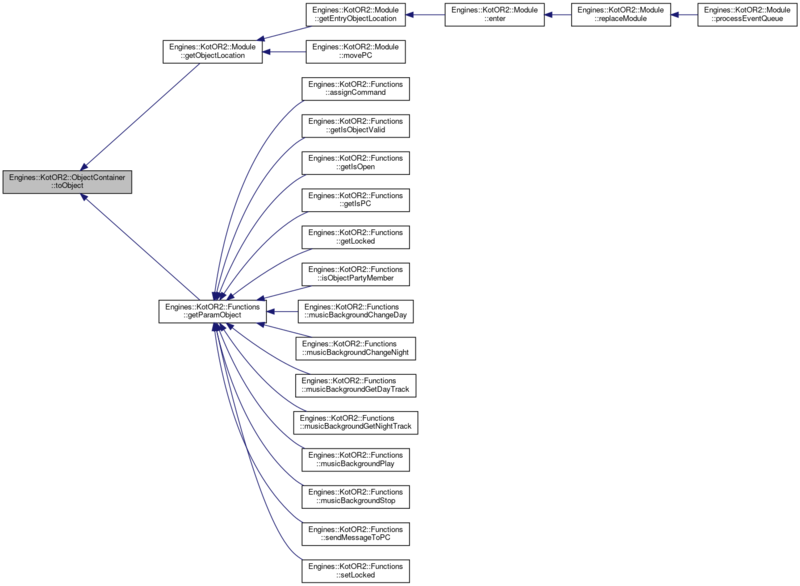 Referenced by Engines::KotOR2::Area::clear(), and Engines::KotOR2::Area::~Area(). Definition at line 132 of file objectcontainer.cpp. Referenced by Engines::KotOR2::Functions::musicBackgroundChangeDay(), Engines::KotOR2::Functions::musicBackgroundChangeNight(), Engines::KotOR2::Functions::musicBackgroundGetDayTrack(), Engines::KotOR2::Functions::musicBackgroundGetNightTrack(), Engines::KotOR2::Functions::musicBackgroundPlay(), and Engines::KotOR2::Functions::musicBackgroundStop(). Definition at line 152 of file objectcontainer.cpp. Referenced by Engines::KotOR2::Module::clickObject(), Engines::KotOR2::Module::playAnimationOnActiveObject(), Engines::KotOR2::DialogGUI::playDefaultAnimations(), Engines::KotOR2::DialogGUI::playTalkAnimations(), and Engines::KotOR2::Module::startConversation(). Definition at line 148 of file objectcontainer.cpp. Definition at line 128 of file objectcontainer.cpp. Definition at line 124 of file objectcontainer.cpp. Definition at line 164 of file objectcontainer.cpp. Definition at line 156 of file objectcontainer.cpp. Referenced by Engines::KotOR2::Functions::getIsPC(), and Engines::KotOR2::Functions::sendMessageToPC(). Definition at line 144 of file objectcontainer.cpp. Definition at line 140 of file objectcontainer.cpp. Referenced by Engines::KotOR2::Functions::getIsOpen(), Engines::KotOR2::Functions::getLastClosedBy(), Engines::KotOR2::Functions::getLastOpenedBy(), Engines::KotOR2::Functions::getLastUsedBy(), Engines::KotOR2::Functions::getLocked(), and Engines::KotOR2::Functions::setLocked(). Definition at line 136 of file objectcontainer.cpp. Definition at line 97 of file objectcontainer.h. 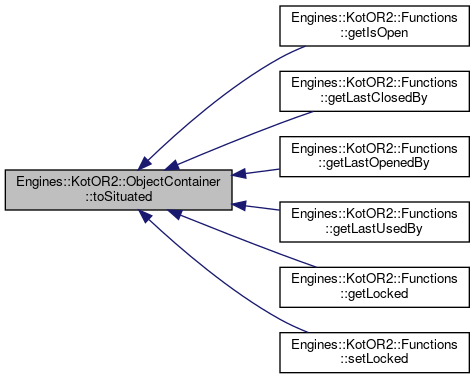 Referenced by addObject(), clearObjects(), findObjectsByType(), getFirstObjectByType(), and removeObject().